When he was in his office, Budd would hang a sign on the door that read, "Jim's in"
In 1858, the Budd family moved from Wisconsin and resided first in Old Liberty, then Woodbridge. They finally settled in Stockton in 1861. Budd graduated with the first four-year class from the University of California at Berkeley in 1873, the same year he married Inez A. Merrill. After graduating from college, he studied law in his father’s office and was admitted to the bar in 1874. Budd always had a strong interest in politics. 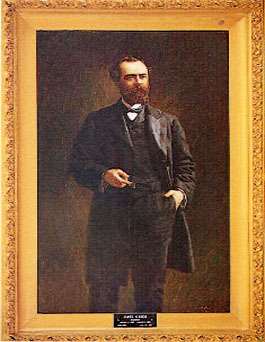 In 1882, Budd accepted his party’s nomination as congressman for his district. It was believed that Budd had little chance of winning the seat, but he conducted a whirlwind campaign by buckboard, a type of carriage, from house to house. He defeated his opponent by a vote of 20,229 to 19,246. In 1894, Budd was selected as the democratic gubernatorial candidate. In protest of the Southern Pacific Railroad, Budd campaigned for Governor by again using a buckboard carriage. Though touted as a hero during his campaign (when he put out a fire at a meeting and later saved a girl from a kicking horse), his efforts were slightly marred by the rehashing of an old scandal. Budd survived the scandal and was the only Democrat to win state office that year. Use the California State Library’s interactive tool to view Executive Orders and Proclamations signed by Governor Budd.